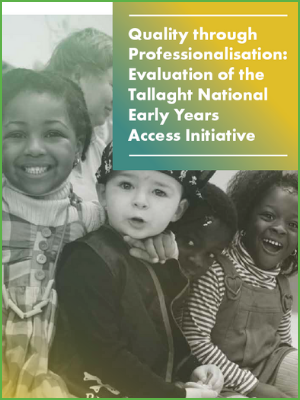 Quality through Professionalisation: Local Evaluation of the Tallaght National Early Years Access Initiative is a report on the evaluation of the Quality through Professionalisation programme, one of 11 projects under the National Early Years Access Initiative. This three-year initiative aimed to improve the quality and outcomes of services in the early years sector. At the national level, the initiative focused on the establishment of an evidence base contributing to improvements in practice and influencing policy changes. At the local level, the initiative focused on building the delivery capacity of local projects. Key findings include information about preschool characteristics, quality within preschools, the impact of training on educators, and trainers' and staff experiences of the initiative.